A few months after forming in late 2012, Albany's Firestarter released its debut EP, New Beginnings. Later in 2013, the four-piece pop punk band released an EP featuring acoustic renditions of songs from New Beginnings, followed by a four-track split with Old Again. We covered two of those releases on MGR and we had a feeling that this band had a chance to be something special after getting another release or two under their belts. 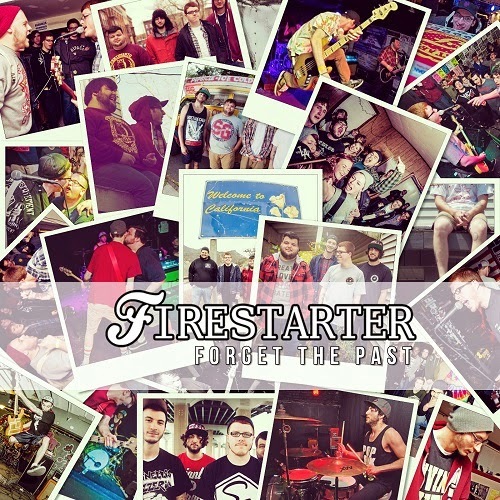 Now, with the release of Firestarter's third EP just over a month away, it's time to dig into Forget the Past. Firestarter wastes no time setting the tone with the upbeat title track. "Forget the Past" is a great song that demonstrates the band's overall sound; fast-paced drumming drives the song in the verses and really makes you want to stage dive, while the chorus is slower and the catchiness of the vocals and instruments is accentuated. "Who You Used to Be" is an even catchier track that makes use of some very solid guitar parts and features a massive bridge that highlights vocalist/guitarist Matthew LaPerche's vocal abilities. "If You Ain't First, You're Last" starts off similar to "Forget the Past," but the extremely up-tempo drumming remains a consistent part of this song from the first second until the end. "If You Ain't First, You're Last" also features an impressive solo that continues on into the outro. Up next is "Tiny Bandages." The instrumental aspect of the song is very catchy and the vocals work exceptionally well, especially near the end of the song. "Woodlawn" slows things down and is reminiscent of Real Friends' "I've Given Up On You." This is, by far, the slowest song on the EP – and one that sees the members of Firestarter step a bit out of their comfort zone; it's very different for the band, but it still sounds great. "Lost & Found" is definitely the catchiest track – as well as my personal favourite – on Forget the Past. The chorus is one that is sure to get drilled into your head after just one playthrough of the song. "Lost & Found" brings the release to a close on a high note with a lengthy gang vocal segment that has a very end-of-the-record feel to it. Now that Firestarter has been together for about a year and a half and has released three EPs and a split, I think it's safe to assume the band's next release will be a full length. If that's the case, I'm hoping that at least one song that is similar to "Woodlawn" makes the cut; it really shows that the band has the ability to slow things down and experiment a little bit. Firestarter has slightly improved with each release, and I'm excited (and hoping) to finally hear a full length from these guys.